Supercharge your rooted Android phone or tablet! 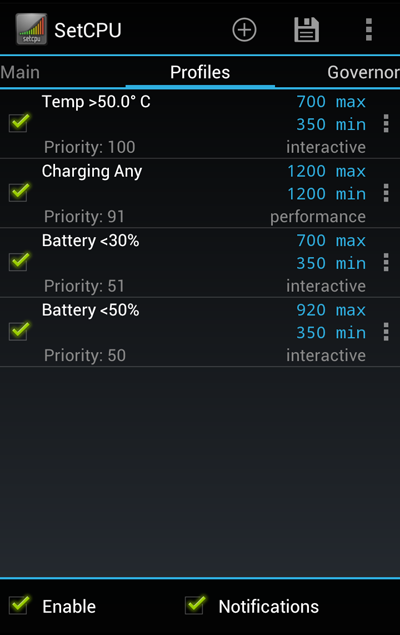 SetCPU is an amazing application that puts you in control of your Android device's CPU settings. SetCPU can help you save battery life and improve your device's performance. 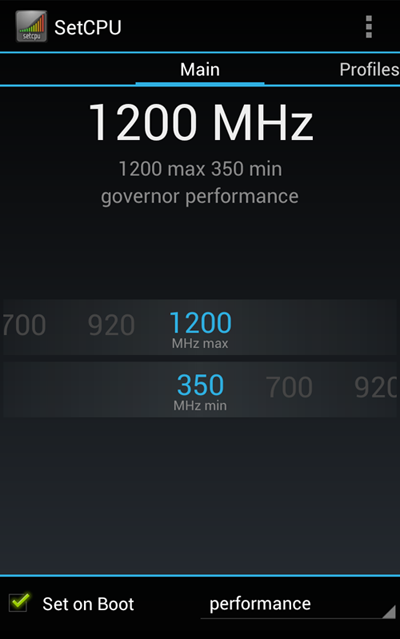 On many devices, with custom ROMs and kernels, SetCPU can overclock, underclock, or tweak voltage settings. 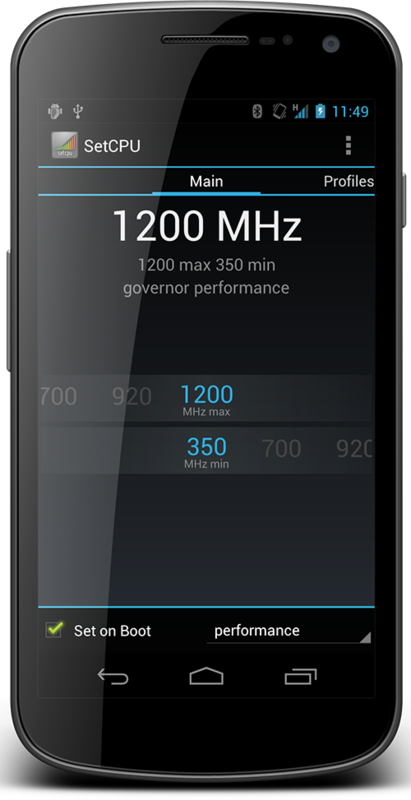 SetCPU works on most rooted Android phones and tablets. SetCPU is available on Google Play now. SetCPU is simple enough for an Android beginner to understand, yet powerful enough for advanced users. It's an essential utility in every root user's toolbox. SetCPU is simple enough for a beginner to pick up. Jump into SetCPU and drag your finger across the sliders to change your device's CPU speed. Want to save battery? Drag the first slider lower. When you're ready, check out some of the other tabs, like Profiles, for even deeper control and customization. Set up Profiles in SetCPU and automatically change your CPU settings based on certain conditions. Set up a Profile to run your CPU run at half speed when your battery runs low, for example, and set up another to keep it at the maximum when your phone is charging. Supercharge your Android phone or tablet now. Download SetCPU, one of the most popular and powerful root tools available on Android, from Google Play, and find out why it's an essential app for every Android root user. SetCPU and content is © Michael Huang 2009-2015. Follow me on Twitter!